Heads or Tails is hosted by Barb a.k.a. Skittles. Thanks Barb! Good question – what’s your answer? Because I honestly don’t know and I have no clue if it applies to me. Brave is a verb. And by being a verb, it implies action. As in, to face or endure with courage. Well, face or endure … what? Emergencies? Life situations? Big decisions? Beliefs? Whenever I think of the word brave, I think of our military men and women who put their lives on the line in order to protect our country. I think of our emergency personnel who risk life-threatening situations in order to save us … from ourselves. I think of our teachers who are brave enough to teach our unruly youth. I think of doctors and nurses who work to improve our way of life. I think of our blue-collar workers who aren’t afraid to step in and take care of the unsavory aspects of our lives. I think of the brave artists who put their creative work out there for all to enjoy, or criticize. And then … there’s me. I am not brave. I am none of these heroic people I have just mentioned. I have never saved someone’s life. I have never done anything life changing. I have never been willing to put myself into an uncomfortable situation simply because it was a job that needed to be done. I don’t even have the courage to send my creative work out into the publishing world. I am actually a coward. But perhaps I’m concentrating too much on the big picture. Perhaps being brave is about more than changing lives but rather, enduring the little, everyday challenges of life. And if we can agree that living our lives to the best of our ability is a form of bravery, then perhaps there is hope for me yet. Falling out of my car at the age of 19 and living with a two-inch scar on my forehead for all the world to see and question. Praying for my oldest son when he arrived eight weeks early, with no explanation and no warning. Losing my youngest son in Sears when he was three years old for 20 minutes and fearing that I would never see him again. Enduring the humiliation of being locked out of my own house and having to humble myself in front of strangers. Fighting for a marriage that I was all too willing to end because I wasn’t brave enough to face my own mistakes. Maintaining a brave face and stiff upper lip for my two small sons when a young girl plowed into us and totaled my van. (husband was out of town and we hitched a ride home with one of my co-workers). Trudging over and through numerous hurdles in order to earn a college degree. Facing my own mortality when we were flying home and the airplane’s landing gear malfunctioned. 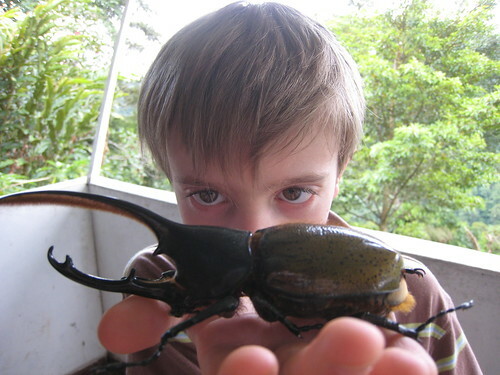 Crushing a Hercules beetle in my house (click if you dare) and keeping it from the boys so they wouldn’t freak out. Braving criticism and hostility by posting my religious beliefs on this blog. All of these things seem so … unimportant and insignificant when compared to events that others have braved in their lifetimes. But that’s okay, I’m grateful that my bravery has never truly been put to the test. ¤¤¤ We live in a world that is enamored with “self.” The culture around us teaches us to focus on our appearance, feelings, and personal desires as top priority. The goal, it seems, is to chase the highest level of happiness possible. The danger of this kind of thinking, however, becomes painfully apparent once inside a marriage relationship. If there were ever a word that basically means the opposite of love, it is selfishness. Unfortunately, it is something that is ingrained into every person from birth. You can see it in the way young children act, and often in the way adults mistreat one another. Almost every sinful action ever committed can be traced back to a selfish motive. It is a trait we hate in other people but justify in ourselves. Yet you cannot point out the many ways your spouse is selfish without admitting that you can be selfish too. That would be hypocritical. Nobody knows you as well as your spouse. And that means no one will be quicker to recognize a change when you deliberately start sacrificing your wants and wishes to make sure his or needs are met. 1. Do I truly want what’s best for my husband or wife? 2. Do I want them to feel loved by me? 3. Do they believe I have their best interests in mind? I will be the first to admit – I’m a selfish person. I am. I used to be really bad, but I’m mellowing with age. I would find myself getting so angry whenever Kevin asked me to join him in something, or he wanted my attention at a given time and I wasn’t ready to give it to him. Granted, he can’t expect me to drop something I’m in the middle of and he’s learning to be patient in that respect, but overall, I would get so annoyed with him (and the boys) whenever they asked me to do something that took me away from MY activities. Wah. I was such a selfish brat. (And still am, to a large extent). I still find myself getting impatient. And I still berate myself about my selfish tendencies. It’s hard to de-program yourself from the assumption that the world revolves around YOU. Society has beat it into our heads that “we DESERVE” so many things – perfect marriages, brilliant children, creature comforts, superior houses, impressive cars … blahblahblah. Which may be true, but not at the expense of those around us. And we certainly don’t have the right to step on toes, or take advantage of those close to us, in order to reach that life trophy. And this is where I think the feminist movement has actually hurt women. Sure, it’s important that we be treated as equals, that we get paid the same as a man (IF we’re doing the same amount of work as our male counterparts – I certainly don’t think it’s fair for a woman to be paid more simply because she’s female), to have the same rights and privileges, BUT, I think we have been so focused on making that happen that we’ve actually hurt ourselves in the process. Now females are so determined to be the best, to have an advantage, to be heard and respected, that the opposite is actually happening; we’re being heard all right, but is it the message we want to project? Our gender has become the aggressor, and though I certainly have no desire to go back to the days when women dressed up and wore lipstick to clean house (*shudder*), I think a little humility is required here. I think releasing our selfish tendencies might be one of the hardest things to master in a relationship. Love is not about taking, it’s about giving, willingly and without expectations for rewards. I’m afraid I failed this lesson today. I simply could not think of something small to buy Kevin. I haven’t given up, there’s still today, but it bothers me that I can’t think of anything. I think this is a message to me that I’m STILL too focused on ME and not really thinking about HIM. It’s not the materialistic aspect of the gift, but the realization that I’m not as in-tune with him as I thought and that I can’t think of ONE small thing that he might like that bothers me. It’s been a long, hard road shedding my selfish nature. I’m certainly not where I need to be yet, but I’m making progress and the fact that I’m AWARE of this flaw is a step in the right direction.